It’s the first week of the school hols and so far we have a good mix of home days and excursions going on – and there has been crochet, hurrah! 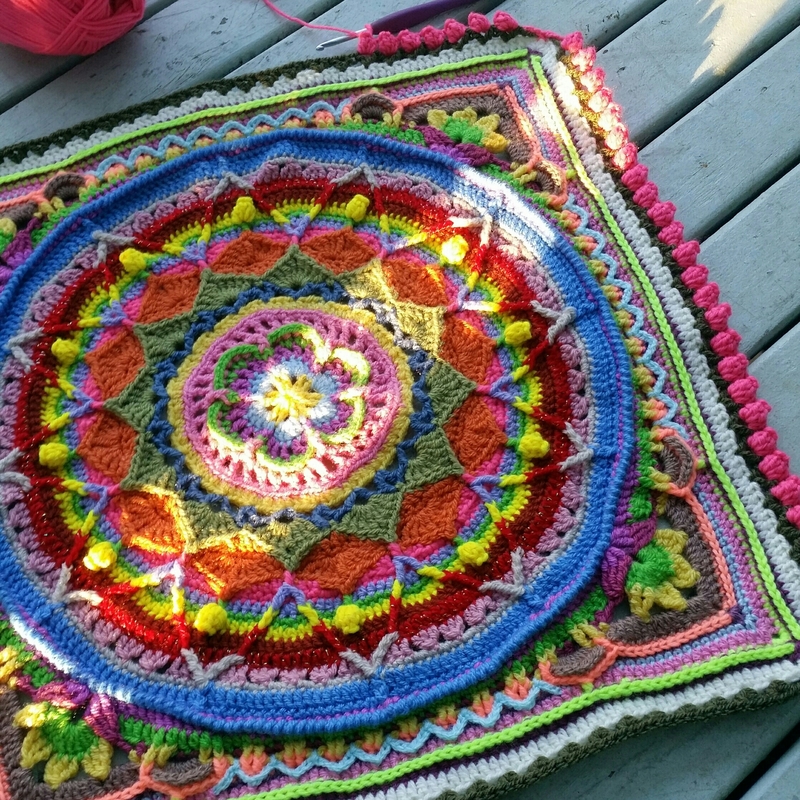 First up, a Sophie’s Universe update. I’m into part five now and still loving her soooooooo much! I’m really glad I bought the book (from Wool Warehouse – for some reason it’s not yet listed in my usual store, Book Depository), it’s just beautiful. I’m also making pleasant and steady progress on my new Willow baby blanket (pattern by Jan Eaton in 200 Crochet Blocks). Six down, fourteen to go! Lastly, I ordered some Cleckheaton California 8ply on a whim last week while purchasing some Lincraft Cakes to try. 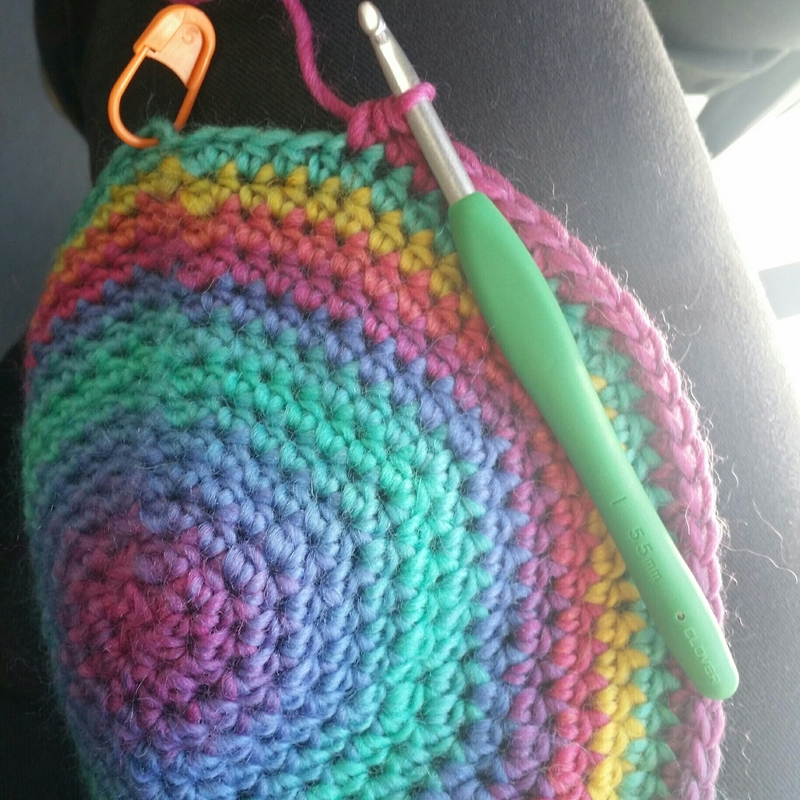 It’s beautiful 100% wool and last night I started a beanie – the colourway is ‘Circus’ and I love it! I took it to the play centre today and got a few rounds in while my girls worked off some of their boundless energy with friends. I got chatting to another woman with wool in her hands – not a common sight! – who was doing Afghan crochet, which I’ve never seen before. So interesting! With a giant knitting needle with a hook on the end, which I assumed was a Tunisian hook but apparently not. I must google. Great to see public crochet and enjoy some impromptu yarny chat! I’ve never actually made a beanie before, not wearing them myself. If it works out ok I’ll share the pattern I found. I plan to donate it to a charity silent auction that’s happening up the coast later in the month, in aid of brain cancer research. I’m not sure of the origins of this event but there seem to be several going on – search Facebook ‘Beanies for Brain Cancer’ for information local to you if you’d like to be involved. You inspired me in your previous post about buying the Sophie book, and i ordered it from wool warehouse too, along with a selection of wool I can use for it. Need to finish pattern testing on the baby blanket before I can start on that though!